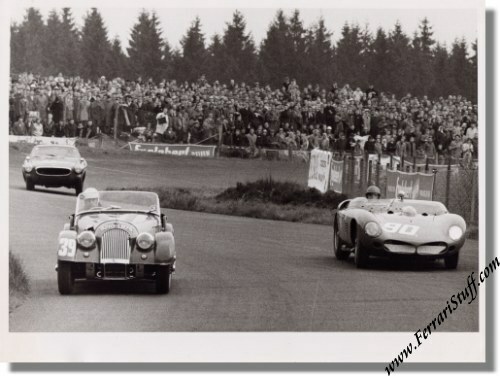 Vintage 1962 photo of Ferrari 250 TRI/61 S/N 0792TR at the Nurburgring 1000 KM. This is a vintage 1962 photo of the Scuderia Serenissima Ferrari 250 TRI 61 which was driven by Carlo Abate and Nino Vaccarella during the Nurburgring 1000 KM race. The car crashed out of the race in lap 7. The car has an extensive racing history and now seems to reside in the USA. The Morgan in the foreground is the Plus 4 of Guy & Claude Savoye which finished 25th. The photo measures some 24 x 18 cm or 9 x 7 inches and is in mint condition.